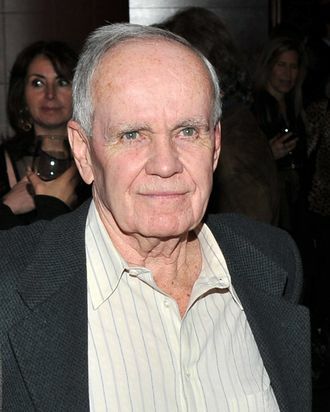 Cormac McCarthy, a mainstay of dusky, brutal, sparse American fiction for almost 50 years, just sold his first spec script to Hollywood, where his name has notched a foothold since 2000’s All the Pretty Horses and 2005’s Oscar-winning No Country for Old Men. The new script is called The Counselor and was snapped up by the folks behind 2009’s Viggo Mortensen-starring interpretation of McCarthy’s Pulitzer-winning apocalypse tale The Road. Producer Nick Weschler says The Counselor “falls smack in the middle of what everyone responds to with Cormac’s novels.” The story revolves around a lawyer who hatches a shoddy plan to get into the drug game in the modern day Southwest — hello, Breaking Bad, sort of, hopefully!